A&D Medical has applied its state-of-the-art measurement technology to monitoring blood pressure at the wrist with the push of a single button. This wrist monitor is smaller, lighter and more compact than other wrist monitors and is ideal for travel. 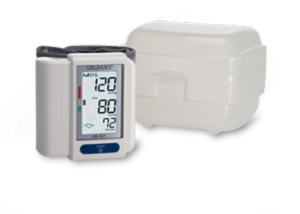 Unlike other monitors that measure blood pressure during deflation of the cuff, the Travel Size wrist monitor measures blood pressure during cuff inflation for a faster, more comfortable reading. 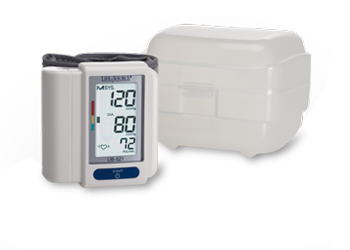 The automatic memory keeps your last 30 blood pressure measurements for effective tracking. The average reading feature automatically calculates the “average” of the total readings stored in memory. The UB-521 also has the Irregular Heartbeat feature. This feature provides blood pressure and pulse rate measurements even when an Irregular Heartbeat occurs and alerts the user. A rigid carrying case is included to protect the monitor when not in use.